Page elements are the building blocks of your pages created with Webstrian. 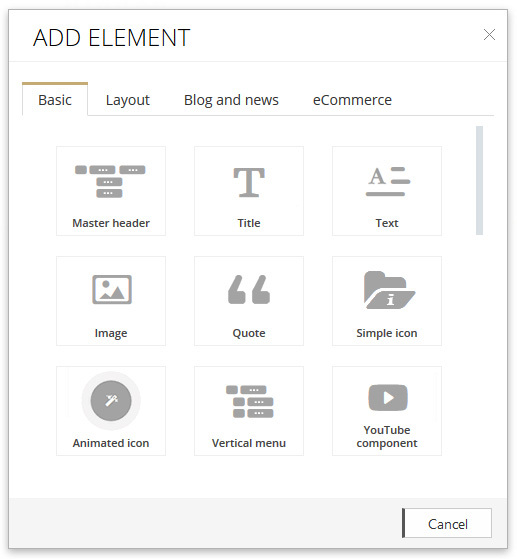 They are user interface components that you plug into the website page to add your content (texts, images, videos, icons, blog posts, news etc.). In essence, one page is built as collection of all the elements you use. Combining them together, you can create every page you can imagine. After you click on the page element that you want to add, the dialog box will be closed and the element will be inserted below the clicked “Add block” link.